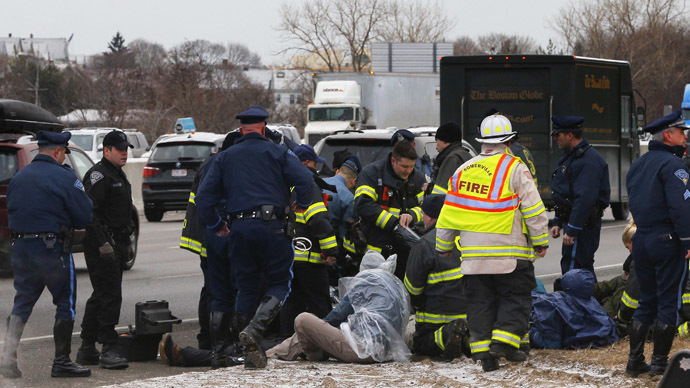 To highlight "police and state violence against black people,” at least 23 protesters were arrested Thursday after chaining themselves to barriers and blocking both sides of Interstate 93 in the Boston area, slowing the morning commute at its peak. Massachusetts state police said the early morning protest shut down Interstate 93 northbound at East Milton Square, which is south of the city, and southbound in the Medford-Somerville area north of the city, according to MyFoxBoston.com. Seventeen protesters were arrested on I-93 south and six on I-93 north. Police reported that power saws were needed to unlodge protesters who had chained themselves to barrels. Demonstrators with Black Lives Matter Boston said in a statement that the protest was an “economic disruption,” one protester told the Boston Globe, "to confront white complacency in the systemic oppression of black people in Boston,” the group added in a statement on its Facebook page. "Today, our nonviolent direct action is meant to expose the reality that Boston is a city where white commuters and students use the city and leave, while black and brown communities are targeted by police, exploited, and displaced," protester Katie Seitz said in a statement. The statement goes on to list a number of people who were killed by Boston police in the last 15 years. “We must remember, Ferguson is not a faraway Southern city. Black men, women, and gender-nonconforming people face disproportionately higher risk of profiling, unjust incarceration, and death. Police violence is everywhere in the United States,” said protester Nguyen Thi Minh Thu. Most of the blocked lanes of traffic were reopened just after 8 a.m., according to state police. So should any losses due to the Boston #BlackLivesMatter protest be turned into George Soros for reimbursement?